As I’ve blathered about in several posts, mirrorless photography — whether Micro 4/3, APS-C, or full-frame — opens the door to more creative options when it comes to optics. Since acquiring my first mirrorless body back in the late 2000’s, I’ve been collecting and experimenting with “classic” glass, and one of the first lenses I picked up was a Voigtlander 40mm f/1.4 Nokton rangefinder lens in a Leica M mount. The first body I used the Nokton on was a Micro 4/3-based Panasonic Lumix G1. What is great about this combination is that the tiny Voigtlander suddenly becomes a fast 80mm telephoto portrait lens. What isn’t good is that one doesn’t get the full-frame benefit of the optics. Fast forward several years and now with the affordable Sony A7 in my possession, the optical design and full-frame focal length of the Voigtlander can be truly realized. 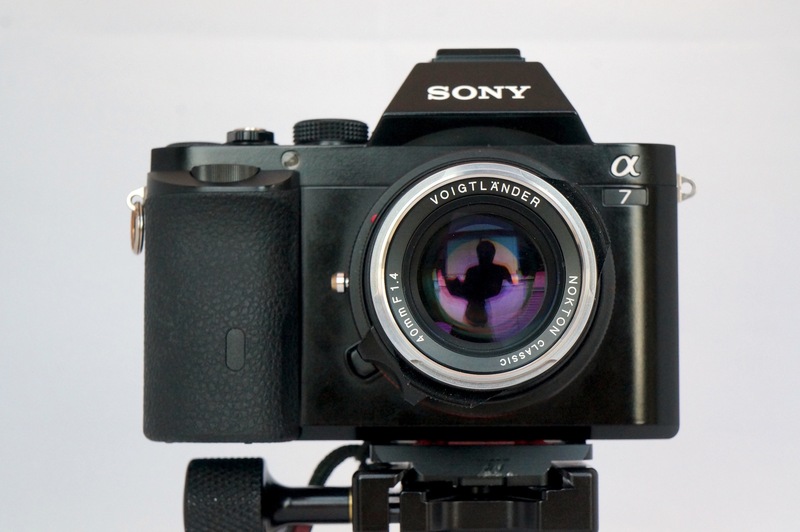 To me the 40mm Voigtlander feels “right” on the A7 body. As a person with large hands, the compact design of the lens, aperture ring and focusing tab all help to make the lens seem like a natural combination for this camera. Unlike a lot of vintage SLR lenses, the rangefinder format — and specifically those of the Leica M family — keep the whole camera package compact and tidy. Even though the A7 is full-frame, it doesn’t have DSLR proportions and so the diminutive size of the rangefinder lens fits the body quite nicely. 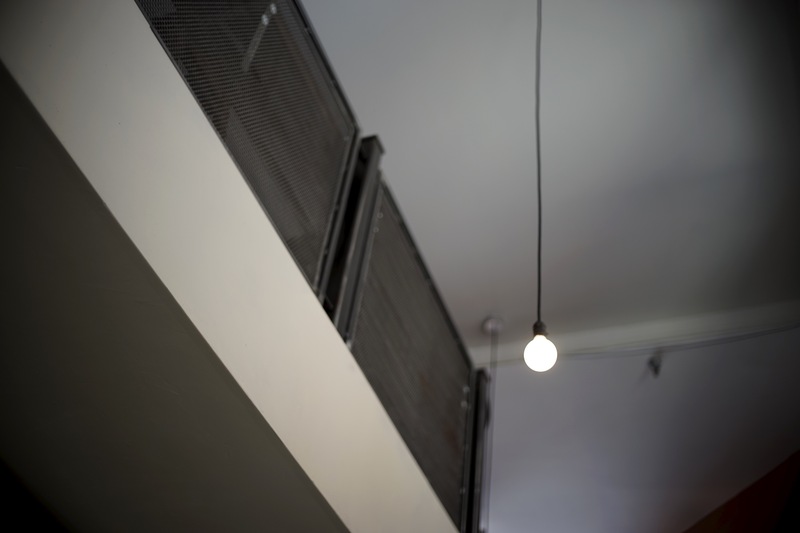 Wide open in low-light conditions, the lens has a strong tendency to vignette on the Sony A7 body. At f/1.4, the use of the in-body focusing aides such as peaking and focus zoom become critical as the depth-of-field is incredibly shallow. The out-of-focus areas, wide open, take on a dreamy feel that I just never seemed to get out of my Micro 4/3 bodies. When you’ve been experiencing the lens as an 80mm telephoto for years, suddenly the 40mm lens is wide on a full-frame A7. 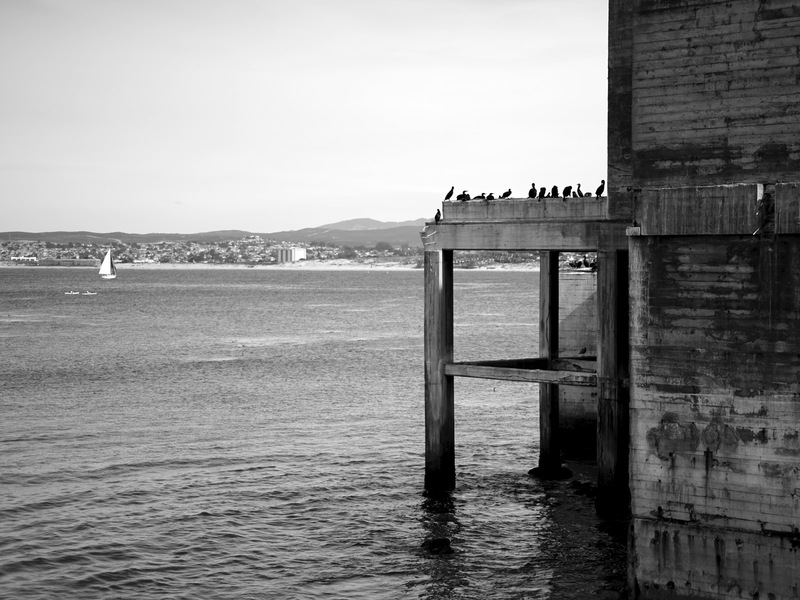 Sometime later I strolled through Monterey, CA, and snapped some photos of the waterfront. In this case, I popped the body in to monochrome mode and captured some contrasty coastal image. What is abundantly clear is that the combination of the Voigtlander’s optics and the Sony’s full-frame sensor makes for a great black and white setup. Some people would argue that I should be shooting in color and converting the shot in post — and I do from time to time. However, for the first three years of my own photographic journey, I almost exclusively shot black and white. As such, flipping the Sony A7 into monochrome is a treat because I see the world in a different way — in light and shadow. I am able to see what I only imagined on film. For street photography in particular, shooting in black and white with a rangefinder lens like the 40mm Nokton is fast-paced and personally rewarding experience. It forces me to think more quickly about the shot I want to capture, and react with my hands in an appropriate way to focus and frame the shot. Now if you add in the design of the Voigtlander lens and the position of its aperture ring, the whole configuration of hand-eye-lens-camera makes shooting less about snaps and more about capturing a moment. Turning to the combination in low light, the shot above is a sample of what is possible. 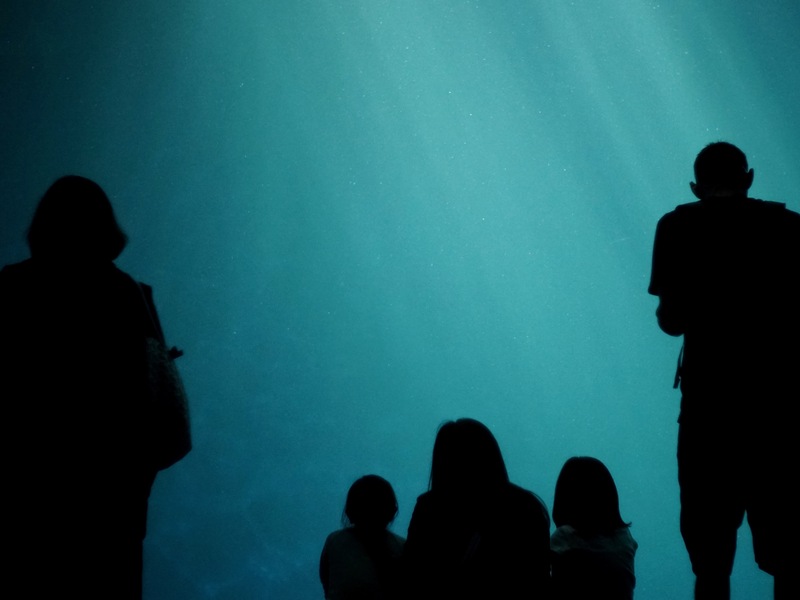 Using a wide open Nokton at f/1.4 at the A7 set at a shutter speed as low as I dare use with an ISO that wouldn’t destroy the image, I captured this photograph in a very dark sea tank viewing area within the Monterey Bay Aquarium at night. I did a little post-processing, but not much and I think the result is quite good. If you look at the water, the grain is a combination of ISO noise and particulate matter in the water. Manually focusing this shot without focus peaking would be impossible under these conditions, and I’m happy to say that the A7 didn’t let me down, nor did the Voigtlander’s optics. 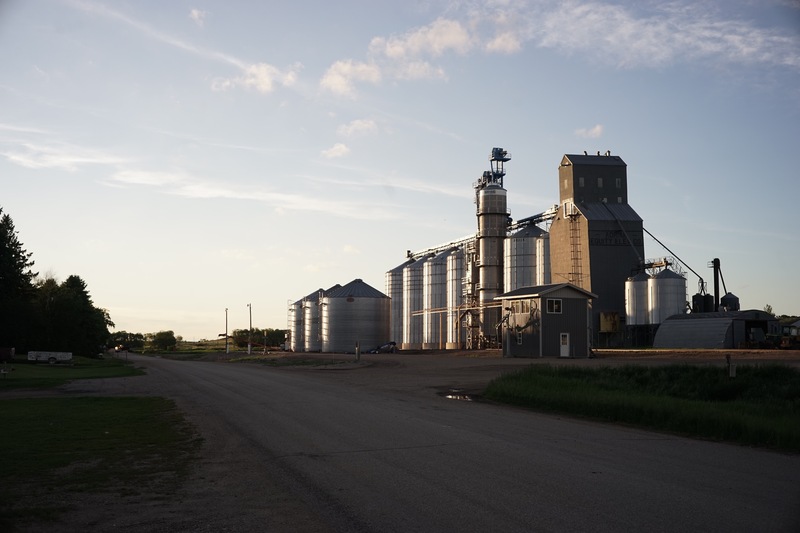 Here we have a shot of the town of Adrian, ND, at sunset. We had just finished dinner and I stepped out of “The Field” to see this in front of me. I pulled out the camera, set the aperture and snapped the shot with auto shutter speed and auto ISO. Once again, the combination of lens and camera didn’t let me down. It felt natural to simply pick up the camera, focus and release the shutter. Something I do find myself using on a regular basis with this lens when walking around town is presetting the lens and scale focusing (it is an old trick I used when I shot hockey on film). Autofocus lenses typically don’t have such markings as they focus at ever press of the shutter release. For street photography or even some telephoto-at-infinity work, this refocus action can make the difference between a good shot and a great one. So to minimize refocusing and to have the lens and camera ready for the quick shot in sunny conditions, I’ll set the lens at f/8, scale focus the lens to a working range of around 10 feet and rely on the depth-of-field at f/8 to nail what I want to capture. If I have time to refocus, then I will but if I don’t, I know I can look at the lens, estimate the distance, prefocus based on the set aperture, and then when needed snap the shutter — even when not looking through the viewfinder. What is great is that the Voiglander’s optics have never let me down. The scale is close enough to be trusted and many times faster than autofocus. All is not perfect, however, with this lens and the A7. I find myself wanting to close focus more often than with the Micro 4/3 bodies, and as is well known the Voigtlander Nokton isn’t designed for that. Although I haven’t invested in it, the way around the problem is to get a close focusing adapter to change the distance of the lens to the focal plane. The adapter is a bit spendy for my tastes, so I’d rather drop the coin on a different lens — but that’s just me; I’m a lens junkie. In summary, I really like the combination of the Voigtlander 40mm f/1.4 Nokton on a Sony A7 body. 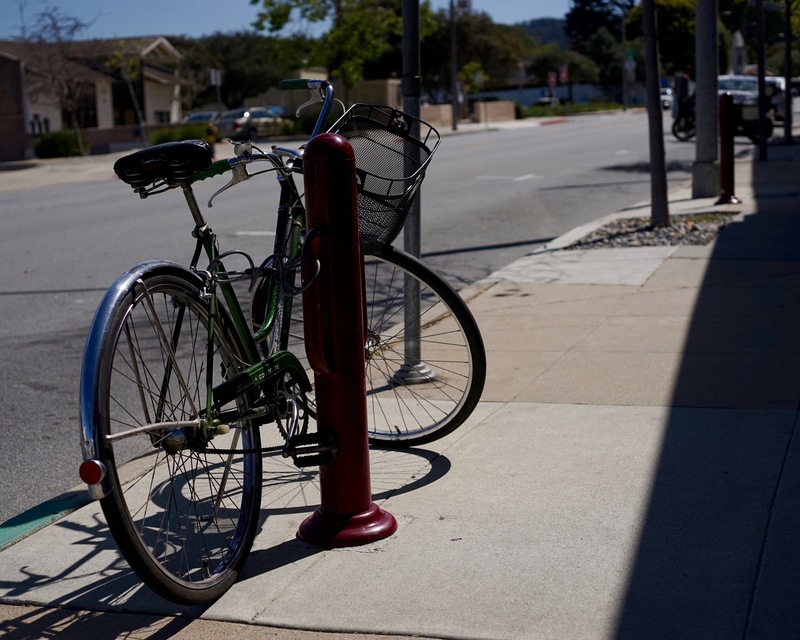 When the camera is configured for manual focusing to one’s liking, the pairing of the lens and the body can be a natural street photography setup from low-light indoor shots to outdoor scenes. The thing one needs to do, however, is practice with the lens and camera setup. I can guarantee that without becoming familiar with how the lens works and spending the time to properly configure the A7, shooting with the fast Nokton wide open will be a frustrating experience as there will be little margin for error. There are a lot of reviews of lenses and bodies out there, so if you were looking for yet another pixel-peep and highly magnified corner sharpness piece I’m sorry to disappoint. To me, coupling a lens to a camera body generates a set of creative parameters that as a photographer, one learns to harness and control. The point of this piece and future ones like it is to share my user experience with a lens on a particular mirrorless body, and to add to the conversation about the pros and cons of mirrorless photography. More of my photos, including more of this lens on other camera bodies, can be found on Flickr. Interesting timing. I happened to rediscover my Minolta MD f1.4 a few days ago; it looks great on the A7 and unlike the Nokton, is better in the corners (I found myself shooting square images more often on the Voigtlander). I like the Minolta bokeh more — it seems more cinematic. My favorite, however, has become the Contax G 45mm f2 — it is spectacular. It is my go to lens for nearly everything. Sadly, the Nokton has ended up on the shelf and will likely be sold soon. It just doesn’t have the magic like the Contax. Nice and helpful review. How would you compare this lens with Minolta MD 50mm 1.4 in terms with sharpness, IQ and colour? I recently purchased A7 and have this 50 from before… Pics are nice, but want to know is it worth to spend $450?